My goal was to finish this quilt by Friday and I did it. Of course, as soon as it was in the washer I started a little pillow to match and now that is not finished:) Oh well. I was alone when taking these pics so I can't give you a good full size picture of the quilt, but it is a great lap/beach/picnic/throw quilt that turned out approximately 52 x 70 inches. The patchwork squares are 5.5 inches finished. 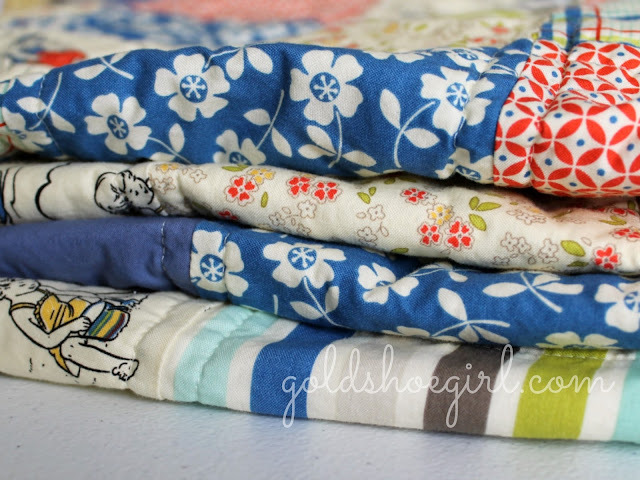 The fabric is Seaside by October Afternoon for Riley Blake. I bought it a while back and just got to it this week. Although I think my timing is pretty good now that we are finally starting to see signs of spring around here it kinda makes you feel like going to the beach. My favorite parts are that little girl in the sand and the too-cute red polka dot binding. I machine quilted straight lines along the seams and did the binding with my machine too. The back is a pale yellowish/off white color that matches the background of the prints just right. Sometimes I impress myself with my photos. Most of the time not so much. Anyways, the pillow is going to be 12 x 16 and as you can see I'm about to stitch around the letters with some blue thread. I'm sure I'll share when I'm done. In the meantime the quilt is for sale in my etsy shop. I was really torn about selling it because as I was making it I started loving it - a lot - and it would look really cute at our cottage - especially with the little pillow to match - so if you want it you better get it quick before I change my mind:)!!! That quilt makes me wish it was summer, so I could bury my feet in the sand. 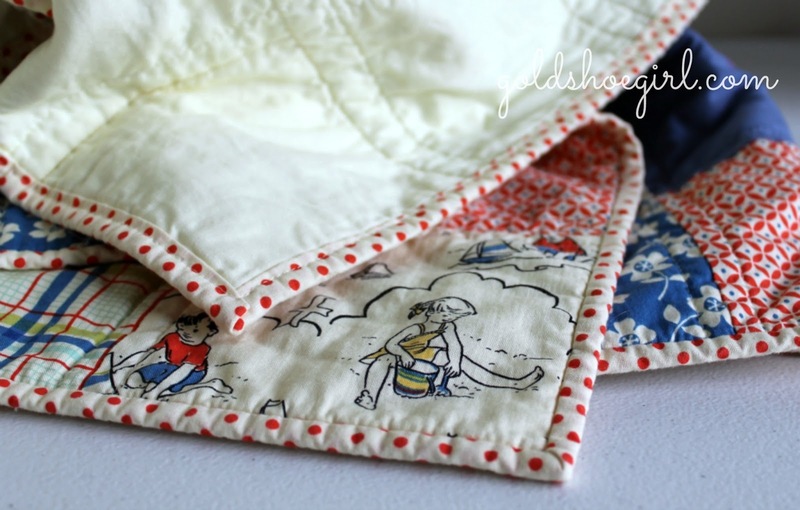 your quilt reminds me of my childhood! thanks for sharing! I am finishing a quilt top using the same fabric. Yes it looks like a retro beach quilt to me and the pillow is terrific!! 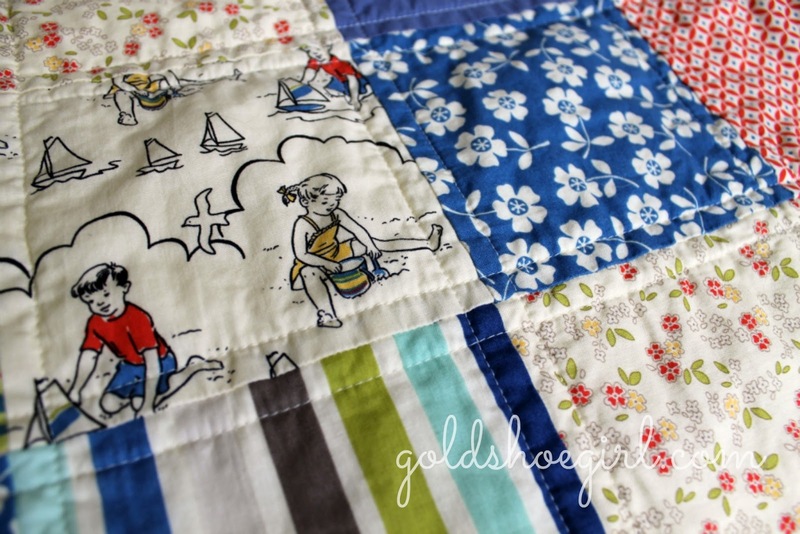 Great beachy quilt! 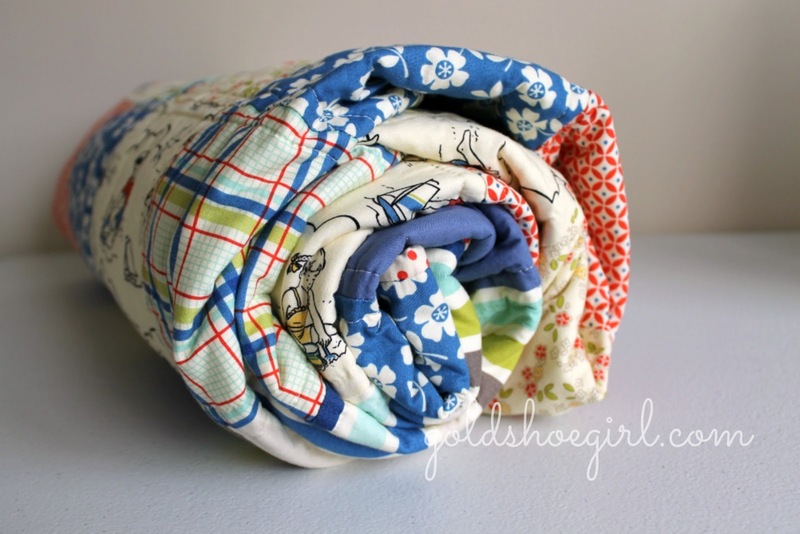 I love that fabric line. What a sweet little pillow, too! This is so fun! Now if only summer would get here! Thanks everyone!!! I really appreciate all your sweet kind comments. Pillow is progressing slowly as we had lacrosse this morning and a birthday party for my youngest tomorrow afternoon. i love this line . .we might not be near the beach but it reminds me of my kids in the sandbox :) i can't wait to see your pillow! I love the reproduction fabrics - so nostalgic! Adorable! I am sure you will have no trouble selling it! I wuold love to know how you do your letters. Are those hand cut or by machine? They look great. 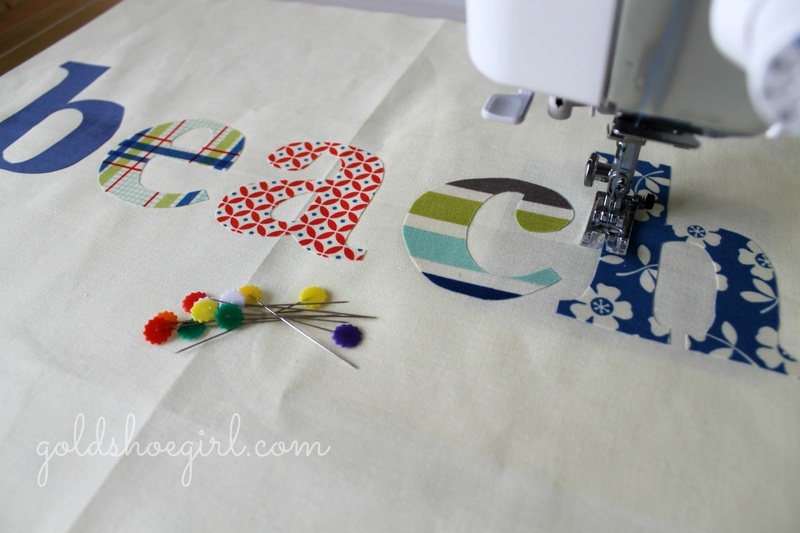 I do all my letters and applique shapes by hand. I usually find a font I like on word and then print those onto paper. Then I trace them onto wonderunder and then iron it onto the fabric and then cut them out. I found that the bigger and less curvy the letters are that the better they turn out when I cut them by hand. Love them both! What a great finish? 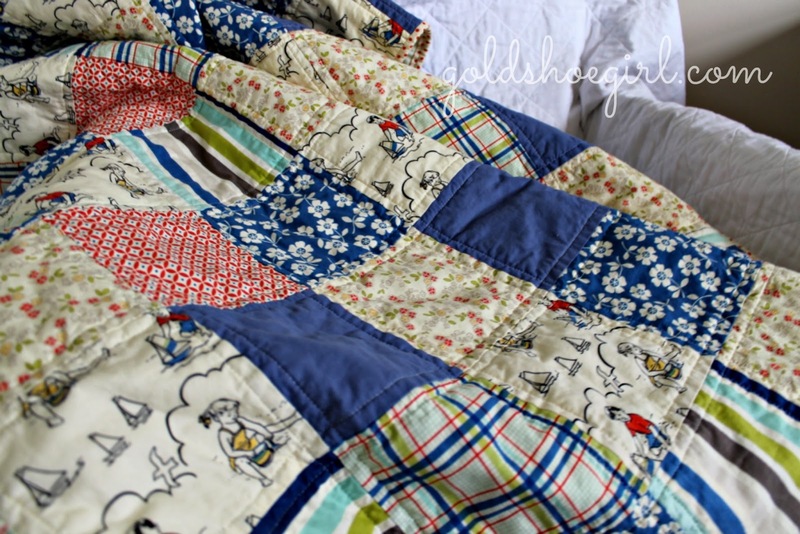 Such a gorgeous quilt - I really love those beachy fabrics! Thanks for linking up this week. You have inspired me....thank you, thank you!